PLANTING: Fall - spring. Key is to plant before fall rain starts. BLOOM/FRUIT: Lavender flowers with brick red stigmas which makes the spice of commerce. 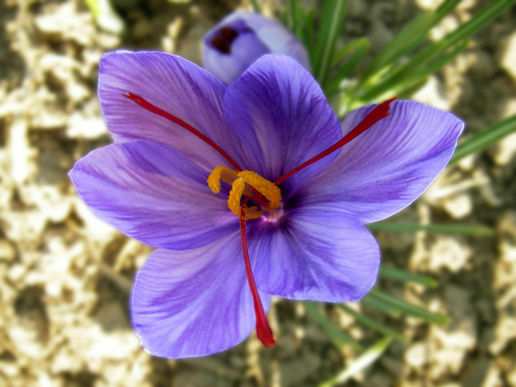 GROWTH HABITS/CULTURE: Saffron is grown from a corm and has grass-like foliage. It looks like a typical crocus. Flowers emerge ahead of the foliage in late October to early November. Fairly easy to grow in loose organic soil. PROBLEMS: Squirrels, rabbits, gophers are the most serious problems. They dig up and eat the bulbs. Rabbits eat the foliage. Repel them with hot pepper, castor oil, and fast dogs. HARVEST/STORAGE: It takes 2 to 3 years for saffron to mature. Harvest around Thanksgiving. About 5,000 stigmas (1700 flowers) are needed to yield 1 ounce of spice. Harvest the dark red stigmas first day of bloom, dry and store them in a cool, dark place. CULINARY USES: Flavor for many foods including rice, meats, soups and vegetables. 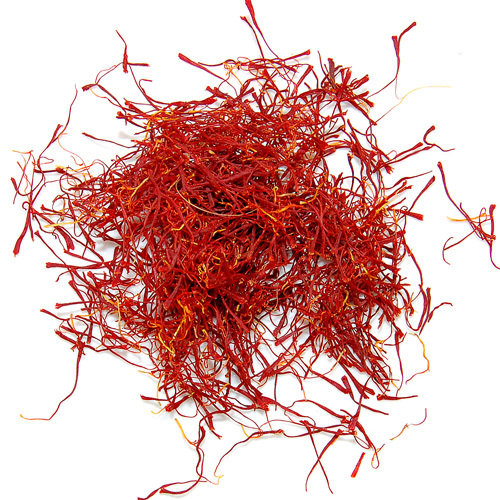 Dark red in its dried state, saffron imparts a rich golden-yellow color to cooked food. It is popular in rice dishes and soups. MEDICINAL USES: According to Odena, a tea or tincture is good for lightheadedness and considered an aphrodisiac but too much may cause a narcotic effect. LANDSCAPE USES: Beautiful bulb for fall flower color. OTHER USES: Cosmetics, dyes, and perfume.